For some time I’ve been reading about the earliest type of photographic printing, made using paper soaked in salt, which was then painted with silver nitrate and exposed to the sun (with a negative, making a contact print). While I was in Lisbon, I wanted to try and make salted paper prints using images I’d taken of salinas in Figueria, Aveiro and Rio Maior. The images felt out-of-time, and I felt that using this process would echo that sense of the past and present layered within them. In fact, the process of making the images became about many things, including obsolescence, communication, language, regulation, and travel. After discussing the idea with Fabrice at Fabrica Braco de Prata he took me to kameraphoto, which turned out to be a digital printing laboratory. Having explained the process I wanted to use they said they only used digital now, and sent me to Lisbon Photographic Archives. Meanwhile, I found my own way to Colorfoto, lisbon’s only source of photographic chemicals (that I could find, anyway) and asked about the chemicals I needed. They couldn’t help with the silver nitrate but a guy in the queue sent me to Camilla Watson and her magical darkroom and studio in Mouraria. On my third visit to the archives I got hold of Luis Pavao, who was a wonderful source of information about the salted paper process, having tried it himself, but also full of warnings of its problematic nature. From a website, I found that you could buy silver nitrate pens in chemists so I had bought a couple of these – apparently used to cauterise wounds and baby’s bellybuttons – but Luis looked at them kind of fascinatedly and then told me where to purchase proper silver nitrate, from a nondescript chemical company in Av. Dom Carlos. I went there and had to sign various forms, in an old office complete with old chemical jars, and I finally received the precious brown bottle. I won’t even go into my multiple walking tours of lisbon, in search of the right kind of paper. Trying to source things, I feel I am in the shoes of my great-grandparents again, arriving in strange places, not understanding the language, the way things work like the times of day things are open or closed, the procedures, the rules, the expected behaviours. Going into the Nigerian-run photocopy shop, they give me directions in French purely by landmarks – which I don’t know. I am constantly getting lost, negotiating public transport, using paper maps, as my location services uses up the battery on my phone. This obsolete process I am trying to recreate makes me more aware of the technologies of travel, of journeying, of translation, that we take for granted; how quickly we become helpless without it. Reading Camilla’s copy of The Silver Sunbeam, a book published in the 1860s about the then new technologies of photography, I am drawn backwards in time, and amazed by the careful and thorough detail of the explanations. Camilla Watson is an unusual figure in Lisbon – an Englishwoman, she has lived and worked in the Mouraria area for years, her studio producing images of Lisbon that are hand-printed on walls, boards, anything she finds. The walls of the district have become a record and celebration of its inhabitants. Using the studio, I love the way people come in and out, and sit and chat in the square outside. I meanwhile have gloves, eyemask, surgical gown and am soaking pieces of paper with salt, drying them, then painting them with the highly dangerous silver nitrate, all in darkness. Chemical processes, fabrication processes, changing states, is the work in the making or the connections that happen through the making? And is it in part the journeys in space/time to make the making, that develop an understanding of place? So the ‘artwork’ is in part a vehicle for the other/research? The artwork contains these journeys and connections. The process is represented by an ongoing and changing artwork. The first test works – I expose the paper in the sunny square outside the darkroom with kids playing and a man washing in the fountain. Images appear, faded brown, indistinct, an index of memory. I repeat the process with large sheets and huge, ghostly salt-piles take shape. There are splashes and discolourations. To me the imperfections serve to tell the story of the making of the work, and seem appropriate to the salt-making processes I documented, which sits between now and then, here and there. I went to the Mercado De Ribiera, Lisbon’s oldest indoor market, around midday on Friday. Some of the stalls were packing up, but the cavernous space was half-empty, anyway. A couple of stalls sold bacalhau (salt cod) alongside products imported from Brazil and West Africa familiar to me from Brixton market stalls. Many of the fresh fish stalls were closed, and the piles of polystyrene crates nearby the open stalls had labels from Norway and the other Scandinavian countries. Markets change, supply changes, demand changes. 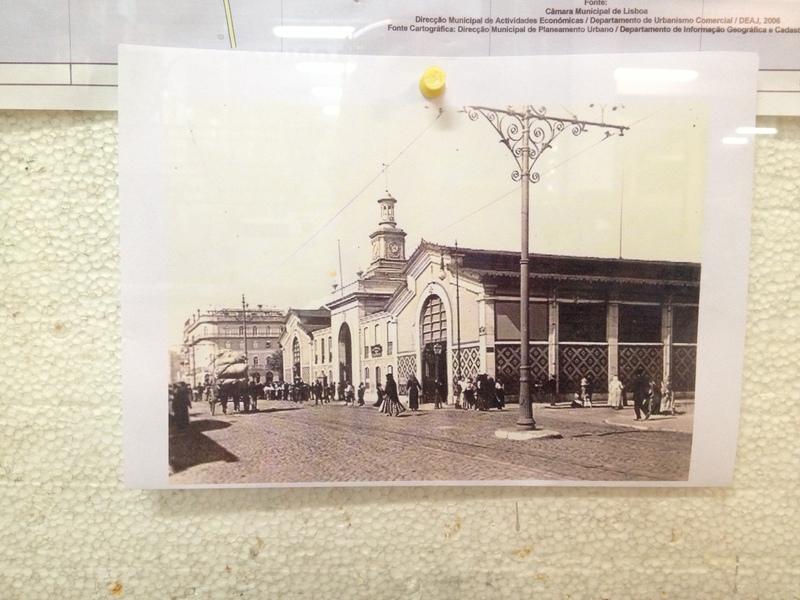 The oldest reference to a Lisbon Market dates back to the 13th century, and there has been one in this spot since 1771. Once upon a time, fish was unloaded directly from the fishing boats at the dockside to this market. The first document related to cod-fishing is dated 1353 and refers to a treaty between Portugal and England governing Portuguese fishing in the North sea. The Newfoundland cod fishing routes emerged at the beginning of the 15th century, as Portuguese explorers opened up the territory for fishing, and by the mid 16th century, 60% of all fish eaten in Europe was cod, and would remain so for the next 2 centuries. This diminished after Spain annexed Portugal, and after long wars with the English over control of fishing territories, but Portuguese salt was still seen as essential to the fishing trade and in 1830 the trade revived, with ships setting off with their salt supplies from Aveiro, Figuiera and Lisbon, catching and salting the fish on board, and bringing it back to be dried on open air racks – a complete circle. 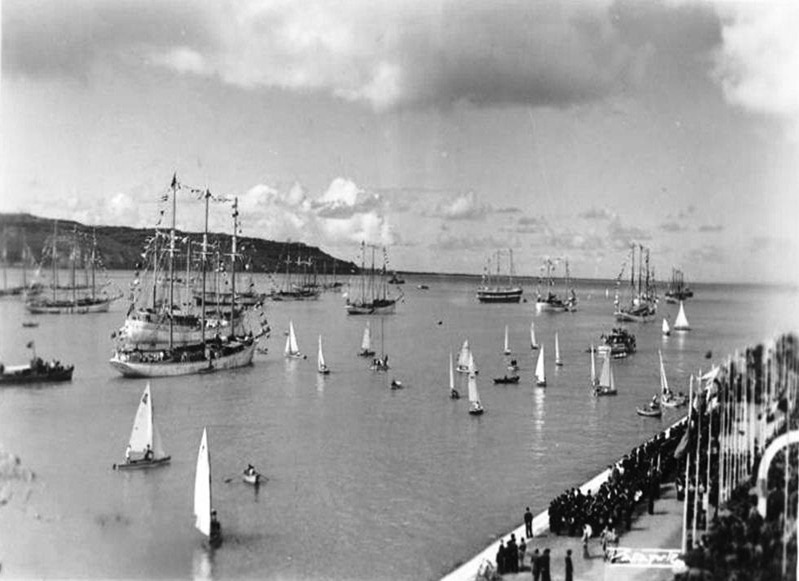 Under Salazar, the trade was promoted and expanded and the annual departure was an important event, with ‘dozens of ships painted white and bedecked with flags, receiving the blessing of the church’. This rather beautiful and sad Canadian documentary made in 1967 gives an idea of the trade as it was only 50 years ago. I’ve been reading Rebecca Solnit’s new book, The Faraway Nearby, which starts out: “stories are compasses and architecture; we navigate by them…a place is a story, and stories are geography.” The relationship between stories and places, stories and architecture seems to be reciprocal, in that architecture, and place, contains narratives. The structure, space and layout of the Mercado de Ribeira acts as a relic of times past, of a particular moment of supply-demand-trade not just locally in Lisbon, but globally. So the architecture is a memory, and a narrative, but how legible is it? Can we read from this structure past attitudes to trade and migration? And how does it adapt to the present? Like Brixton Market, it is trying to reinvent itself, the top floor now hosting evening events and a Saturday ‘craft’ market attracting a different crowd. 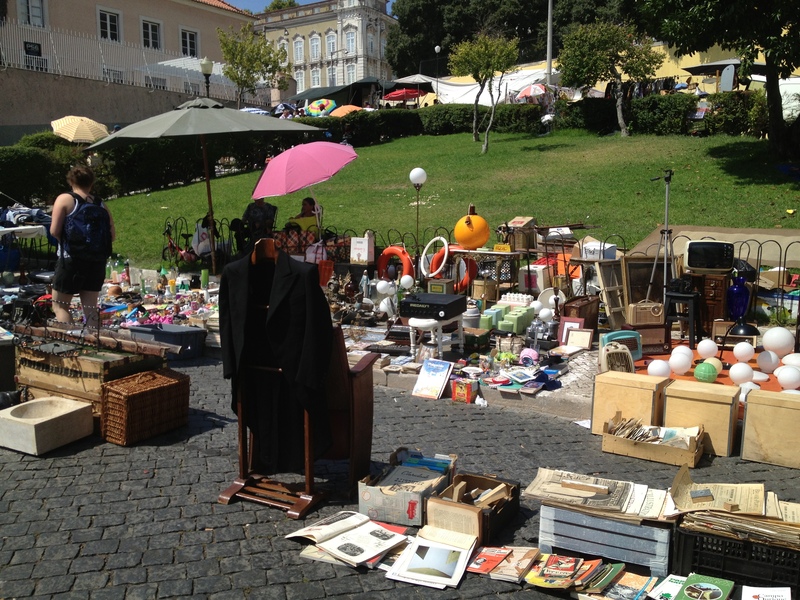 The next day, I went to to the Feira da Ladra market, which is also centuries old, with stalls and cloths laid out on the ground selling all manner of objects old and new. The hustle bustle here was in marked contrast to the Ribeira market, with locals, tourists, migrants, and dealers dealing and just looking. 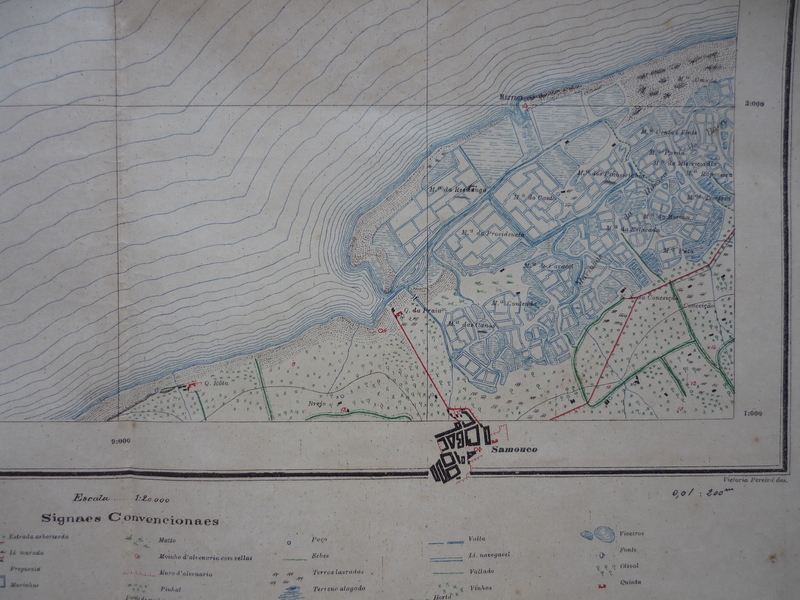 I find old maps of Salinas in the Rio Tejo area, and a leaflet from Aveiro. The maps, which dated to 1898 and 1902, show lots of Salinas along the Tejo, near to St. Iria and Samouco. 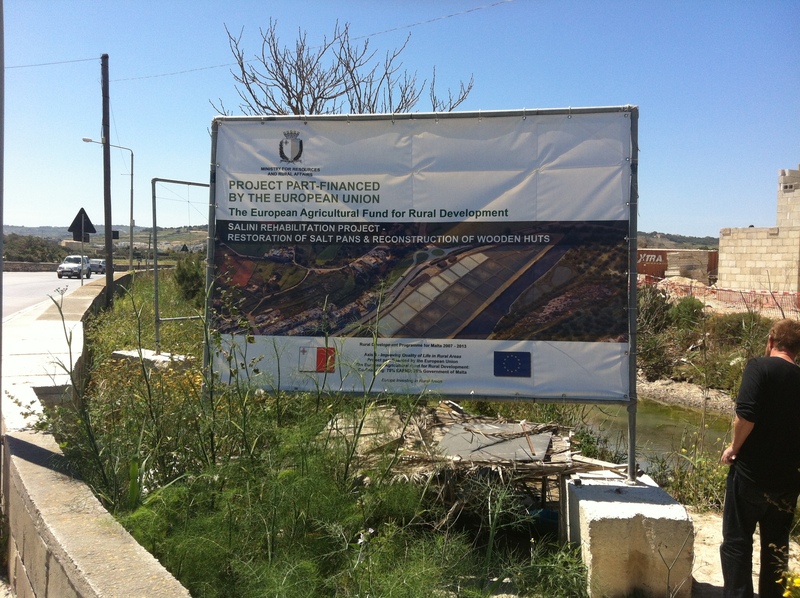 There are still Salinas at Samouco, now a nature reserve, but the Santa Iria area seems mostly to be motorways and industrial areas today. 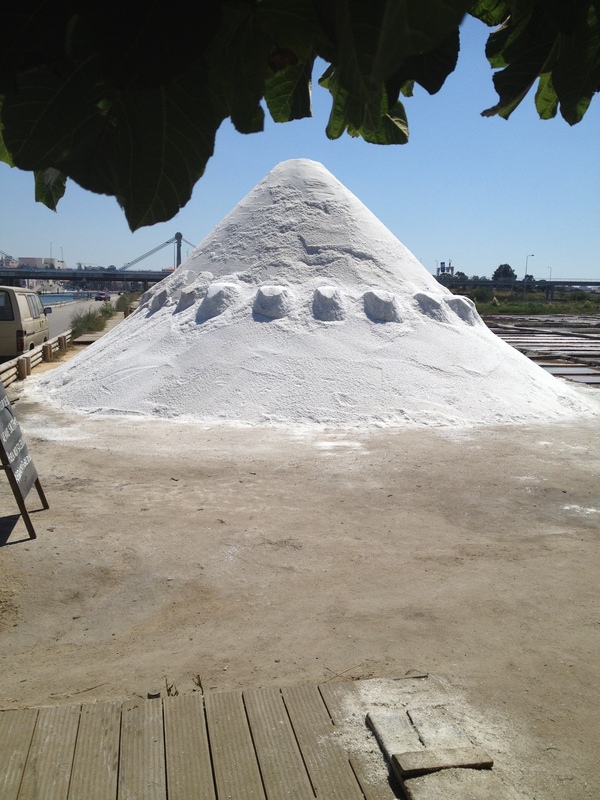 Neves, R, Petanidou, T, Rufino, R & Pinto, S (2002) ALAS – All About Salt: Salt and Salinas in the Mediterranean. Tipografia Cruz e Cardoso, Lda. The next morning before leaving Figueira, we pass an old shop with strange window displays combining typewriters, tins, dolls and plastic flowers. Inside Casa Encarnacao (which is a functioning grocery store) we have a coffee and Pastel de nata and the shop guy tells us his story. He has been here 4 years, was born in Angola but his parents came back in 1975 and they have never been back. When they moved to Figueira, they didn’t know anyone and just landed up living in a building in a street, which he later found out his great-grandmother had lived in. ‘Its a small world’ he says. 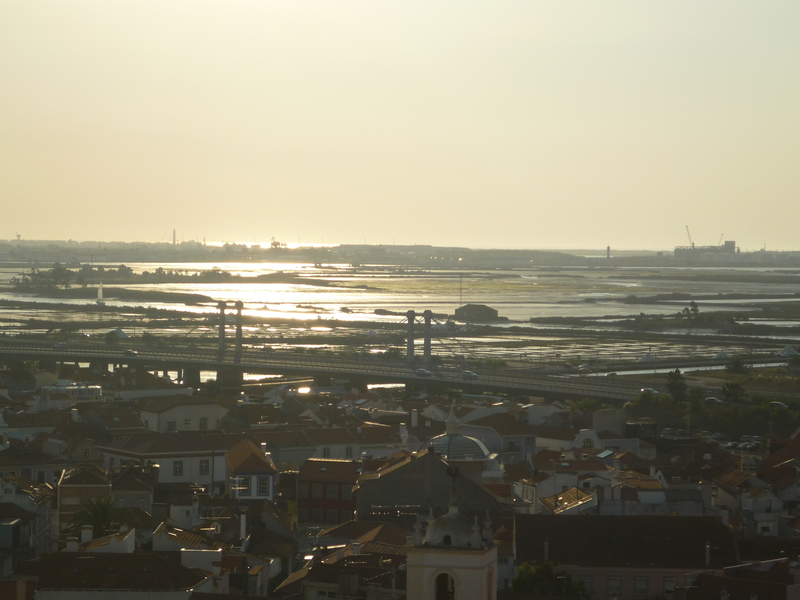 We set off up the coast hitting a very slow and bumpy road and eventually arrive in Aveiro, again crossing a wide river inlet. The water is channeled through the city with canals, and old Art Nouveau and traditional tiled houses line the banks. Our host Ani lives in one of the few tower blocks in the city and she invites me to come and see the view from the top – which is breathtaking – looking north, a patchwork of endless water-fields, once all salinas, stretching as far as the eye can see. In the distance, we can see fires, which Ani, who is a social worker, says are lit by people who are suffering mental health problems due to the current economic situation. She says her husband and friends are trying to set up a project to run nature walks through the water-fields, to encourage more tourism and growth in the area. On ground level, crossing the canal to the Marinha do Troncalhada, we visit one of the few remaining functioning salinas out of that maze of shallow water-fields. This is another eco-museum, although it seems to be mainly a productive space with huge mountains of salt lining the canal banks. Joao and Maria, who are friends of Joao who runs it, and they come down to help him as his wife is in hospital. Maria speaks English with a Canadian accent and it turns out she was a returnee, having emigrated aged 9 but returning aged 23 to marry Joao as his family-owned hardware store in Aveiro needed him. She said she always felt a pull between the two, and felt there was something different about her. People emigrate to better themselves, she said, and if they haven’t succeeded, they don’t come back. There have been salt pans here for 900 years, Maria says, and the fishermen used to take the salt, catch fish, salt it on board, and bring it back. So salt cod became essential to the Portuguese culture and traditions. Today, fish is imported, frozen. Its then defrosted, salted and repackaged as a local and global export. But the salting is not necessary for its preservation, so why continue to produce it? As Maria says, ‘We like the taste. We’d rather have that for our cooking.’ Even as global cod stocks dwindle and the fishing trade may no longer be run by Portuguese sailors, cultural preservation and memory prevail. Before we leave Aveiro we drive out to the Gafanha Da Nazare, where the bacalhau is produced today in huge warehouses. A rusting sailing ship sits by the dock, now only used for tourism purposes. I find the company that produces salt cod which is sold in Brixton market. We can’t see inside but Rita who works in the factory, says it is all industrially processed now anyway, its not like the old days of laying it out on racks to dry. 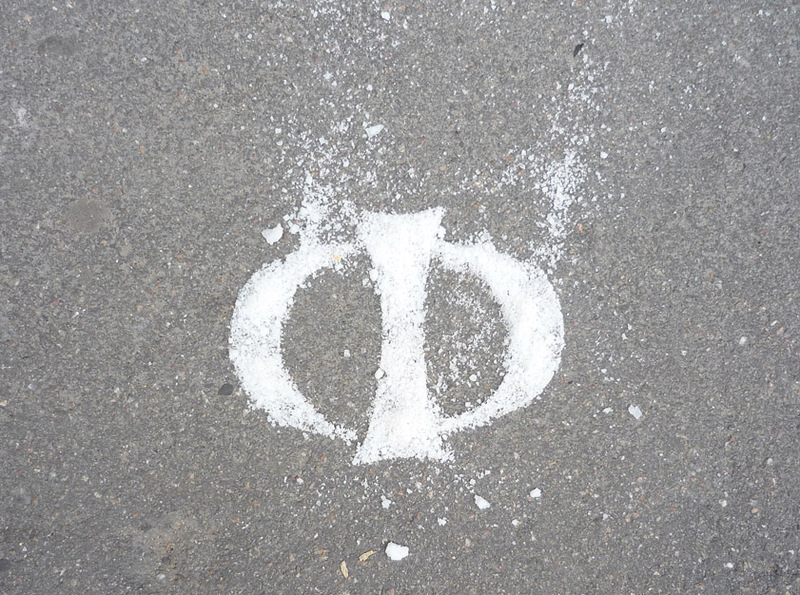 Salt seems to belong to a different time, a slow time of processes that take days, not hours. The slow time of producing place, community, social life. The slow time of sea travel, and the slow adaptation of cultures to each other. Technology allows salt and salt-cod to be produced faster, but it lacks the complexity, or authenticity, of the slower-made product. It allows people to move faster, build faster, but what does this do to the culture of our cities? We are travelling north up the Portuguese coast from Lisbon, but before we leave the city, we visit the Jeronimos Monastery with friend and colleague Ricardo. He tells us that the church used to hold a mass for all the fishermen before they set off to fish in the faraway cold Northern seas; this was the importance of the cod haul to the people of 16th century Portugal. The emblems of fishing and the sea can still be seen carved into the majestic pillars of the interior of the church. Our first stop is Caldas de Rainha, where we stay with the Periera family, Clara, Amilcar and their daughter Mariana, to visit nearby Salinas at Rio Maior. The town was founded by a royal princess who had a liking for the natural sulphurous thermal springs, and had a hospital built there. In Rio Maior, up in the hills about 20km away, there is a natural saltwater source which has been exploited for centuries. Today, a well is pumped using ancient technology to fill the shallow, geometrically arranged pools of salt. The salt is scraped from the surface of the drying pools and piled onto raised pallets, making something akin to a primitive shelter in form, and allowing it to dry slowly in the sun. The ‘village’ of salt warehouses and wooden cabins is mostly deserted when we visit, an EU sponsored tourist facility that seems to be on hard times; the main customers of the cafes seem to be the workers of the salinas. The Perieras tell us that Portugal is like that; tourists tend to cluster in droves at the main ‘sights’ such as nearby Obidos, and not visit the less well known places. They invite us to have a barbeque with them and as they pile plates full of grilled sardines, bream, fresh corn bread, and salad, we hear migration stories old and new. The economic situation has caused young people like Mariana to consider moving abroad in search of work, as the only job she can get in her hometown is as an ‘intern’ in a lawyers office, with a capped salary of around 600 euros a month (after a postgraduate archeology degree). Meanwhile, her dad Amilcar describes how he was exiled from Angola aged 20, when the Portuguese rule ended, and his family came back to Portugal with nothing, only the clothes on the back, no papers, or money. He had to start from scratch and began working to support he family, eventually becoming a teacher. He gets emotional when he talks about the country he left behind, says he could never visit, he is a ‘soudade’ – a word he says is impossible to translate exactly. Its meaning is to do with absence, nostalgia, about missing someone, or somewhere, knowing you will never see them again. The next day we travel on to Figueira da Foz, a bustling seaside resort with mega casinos and an endless sandy beach. The town is reached by a suspension bridge across a wide delta, on one side of which lie abandoned salinas and the other a busy port. The salinas here are also a tourist attraction; going back out of town and across the bridge, we follow signs for the ‘Ecomuseu de Sal’. The new timber museum building is an echo of the sparse scattering of timber huts which dot the flat landscape of the delta. Cristina, who it seems functions as museum guide, receptionist, salt dealer and much else, tells us that she is an ‘intern’ like Mariana, and her job here ends soon. As she shows us around her passion and knowledge for salt and its production are apparent, and it seems a wasted opportunity that she is not given more security and reward for her knowledge. She says her father runs an industrial salt production facility which she used to help out at. Describing the different processes, she says that the industrial one, where water is forced through rocks, takes only 5 hours and uses the material only once; the salt then has to be cleaned, and chemicals added to it. The Salinas’ traditional production uses a natural filtration system in which the saltwater is let into beds slowly, increasing in salinity as it gets shallower and more concentrated, and then evaporating naturally to leave ‘pure’ salt which also contains other minerals. The salt water is re-used 4 or more times, and the evaporation process takes 5-6 days. But whilst the industrial salt-making is still in production supplying agriculture and industry, the Salinas of Figueria have dwindled from 229 to 45, once employing 1500-2000 workers at its height, now many pans lie empty or are used for aquaculture instead. This seems to parallel what is happening to Portugal at the moment, where the natural resources of the country are less valued, and globalised industries mean that young people with skills and talents are going elsewhere or working for a pittance. 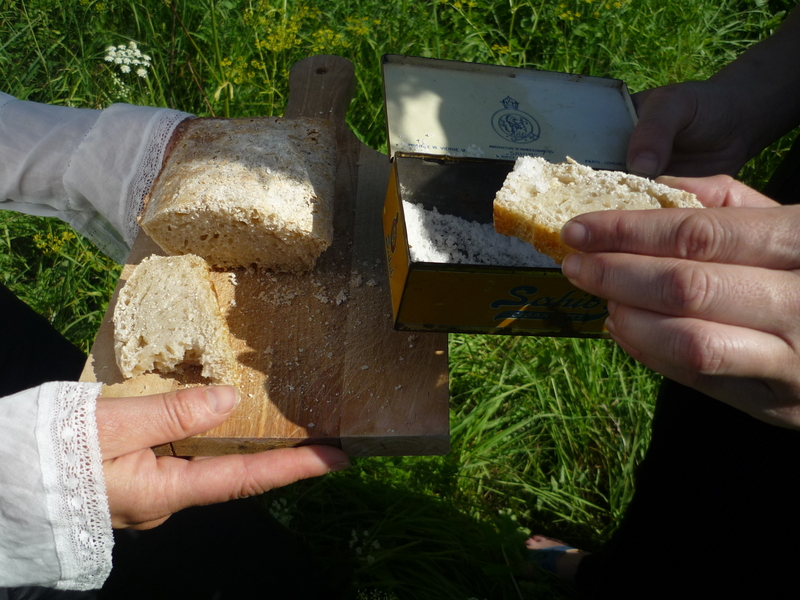 Not to romanticise the life of a salt worker – as we follow the guided route walk for 3 hours in the baking sun, we pass one hut where the workers invite us to join them for lunch, and give us freshly caught and grilled ‘Carapau’ with bread and wine. The guys are very friendly and despite our mutual lack of language we exchange a few words. They go and fish in the early morning and then come to work on the salinas, and its hot, heavy work. 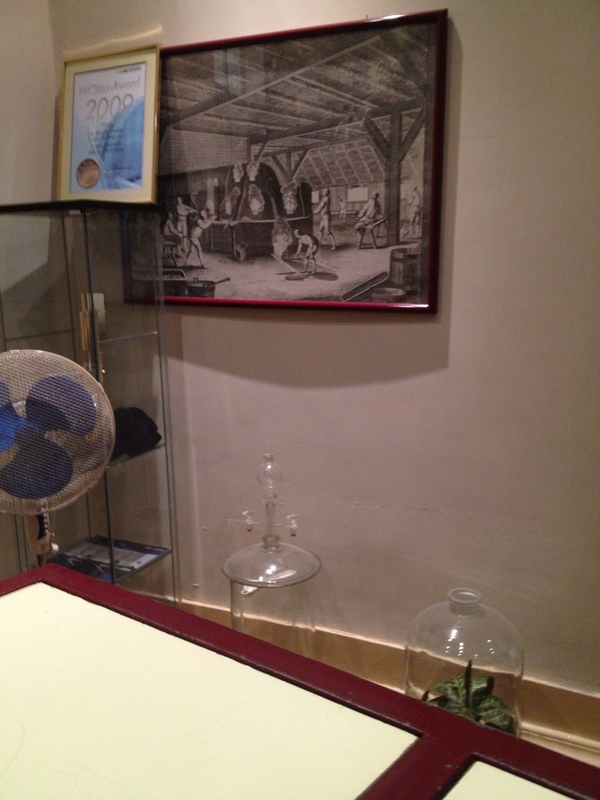 Back in the museum, Cristina shows us the 35kg baskets women used to cart back to the warehouses on their heads. We can’t even lift it. In preparation for my next research trip to Portugal, I’ve begun to map salt products in Brixton market. I found 8 shops/stalls selling a wide variety of salt fish products, although the Deli where Jose had talked about the saltfish trade loop had closed for the summer. According to Mark Kurlansky, the salt cod trade meant huge growth for Portuguese fishing and saltmaking. Sites in Aveiro had been producing salt for centuries, but new saltworks in Setubal became leading suppliers after the 1500s when European exploration overseas headed West to the Americas. According to Deli owner Jose, the saltfish was essential to the long sea voyages which enabled the explorers and later colonisers to travel. Ironically now it is both a national dish in Portugal and a traditional favourite of African Caribbean communities in the UK, communities that have migrant roots intrinsically linked to those of the colonisers. Sugar is often written about in connection with the slave trade, but the place of salt in global trade and migration has been less visible, perhaps because over centuries its value has diminished. I was interested to discover that the companies producing the saltfish for sale in the market seemed to be based mainly in Grimsby and Hull, which was once the main portal of immigration for millions of eastern europeans, mainly Jews. Other producers of saltfish I could find seemed to be based in China, Iceland and Norway. Therefore mapping the routes that this fish goes on before it arrives in the market is getting more complicated. Added to that, Jose said some of his customers take the salt cod they buy in Brixton back to Jamaica as they like its quality. So the saltfish travels even further today than in centuries past. I went to eat Bacalau in nearby Little Portugal (Stockwell) and talked to Catarina, a Portuguese friend and Estefani, a Spanish friend from Galicia, Northern Spain. Bacalau is made with salt cod and while eating it Catarina told me about visiting a very old saltworks in Rio Maior and talking to a man who’d been working there all his life. 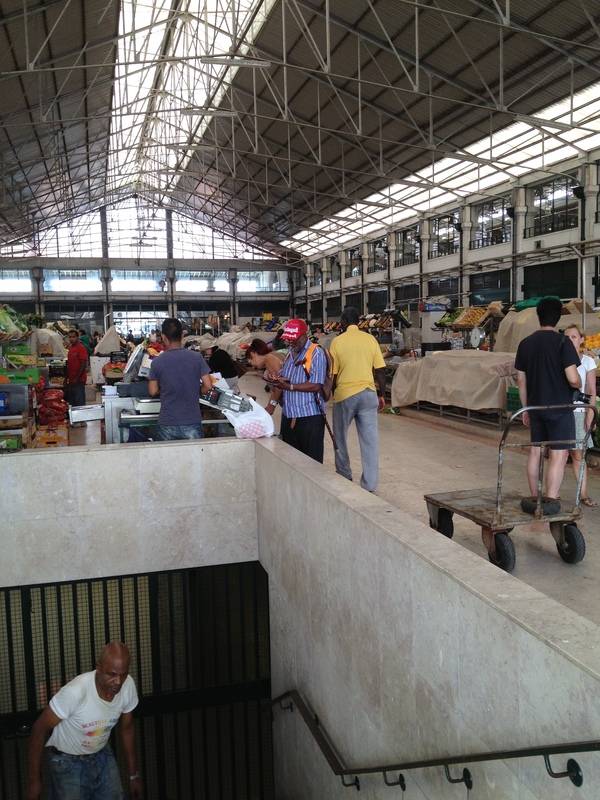 But after my day trawling the market, I wonder how much saltfish is imported to Portugal today from China.